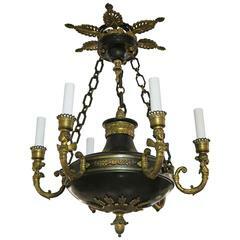 French made hand painted black, red and gold bronze and gilt metal six arm chandelier, decorated with berries and floral leaf motif. Circa 1905. This can be seen at our 2420 Broadway location on the upper west side in Manhattan. 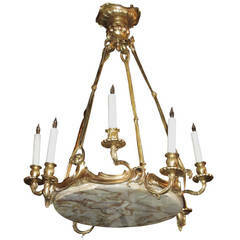 This is a Classic French gilt metal birdcage chandelier decorated overall with a variety of crystsal pendants. The fixture is centred by a crystal spire, early 20th century. Lovely scrolling arms with tall candles of nine lights. 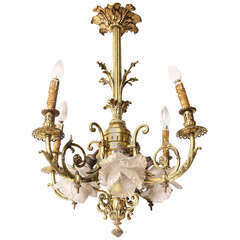 Wired Floral and foliate delicate draping enhance this beautiful piece. Bright gold patina. 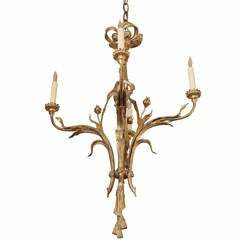 A fine English gilt bronze chandelier of five branches with classical acanthus decoration.